Become a lord of Dogtown in OlliOlli: Epic Combo Edition, now available for the PlayStation 4. More about the game, including what is offered in the Combo Edition below. You can grab yours through Amazon, GameStop, and more. MINNEAPOLIS – Aug. 9, 2016 – Skaters… prepare to grind, shred and rip inOlliOlli: Epic Combo Edition as U&I Entertainment, together with global publishing partner BadLand Games, launches the exclusive PlayStation 4 Combo Edition in North America. OlliOlli: Epic Combo Edition is now available at retailers including Amazon, Best Buy, GameStop, Target and Wal-Mart for $29.99. In OlliOlli: Epic Combo Edition players become a lord of Dogtown in a radical throwback to 2D, side-scrolling skateboarding action . 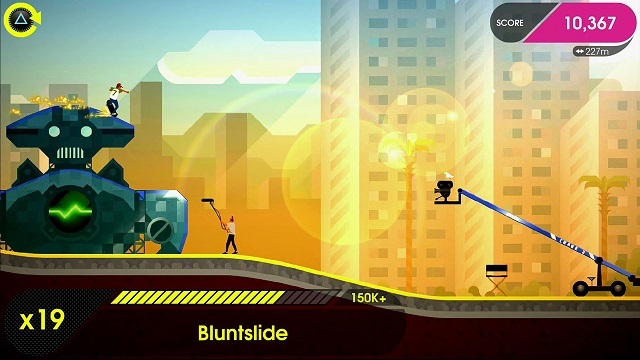 The gold-leaf adorned OlliOlli: Epic Combo Edition brings together the original OlliOlli and OlliOlli2: Welcome to Olliwood for the first time on PlayStation 4 with new worlds, levels and modes to master. The Combo Edition also features exclusive videos and the full original soundtrack from the award-winning OlliOlli2: Welcome to Olliwood. U&I (“Unsigned & Independent”) Entertainment provides global sales, operations and distribution services to independent developers and publishers of interactive entertainment. They have over 25 years’ experience of taking video games products to market around the world. In the United States they operate video game programs for Wal-Mart, Best Buy, Amazon, GameStop and Target. U&I Entertainment is headquartered in Minneapolis. More info can be found atwww.uient.com .